My involvement with WildTrack began a little over a year ago while interning at an elephant research and education facility in South Africa. 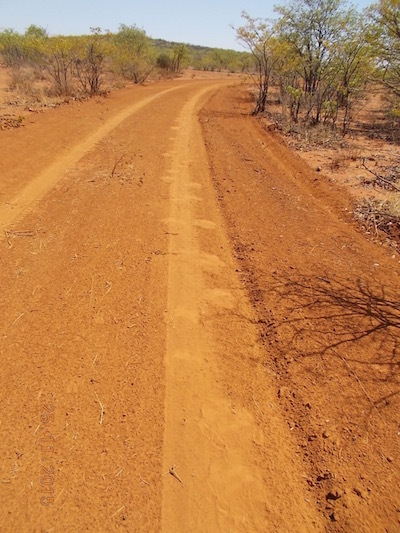 WildTrack was beginning to investigate the possibility of creating an FIT algorithm for African elephants and I was tasked with the job of collecting the initial stockpile of photos from which Zoe and Sky could base their measurements. It was a straightforward project and a good introduction to the processes used in footprinting; I simply had to walk the tamed animals across a pre-raked sandpit, then place the ruler next to the prints and take photos. After taking a couple hundred pictures, I assumed I had mastered the task. When I arrived in Namibia this summer to help with the rhino pilot program, I was in for a shock. In theory, the work was identical to that with the elephants: identify a usable footprint in the sand and snap a picture. In practice, it was completely different. Most prints we encountered were muddled by other animals or camouflaged by the grass. Often times, the rhinos walked in seemingly aimless directions (though I’m sure they had a purpose and destination), causing us to retrace our steps or walk in circles while following them for miles through the dense bush. Despite these challenges, however, it took only a few days to become proficient at identifying the tracks and I quickly learned to appreciate tracking as an art in addition to a science. I then quickly fell in love with this new found artform. 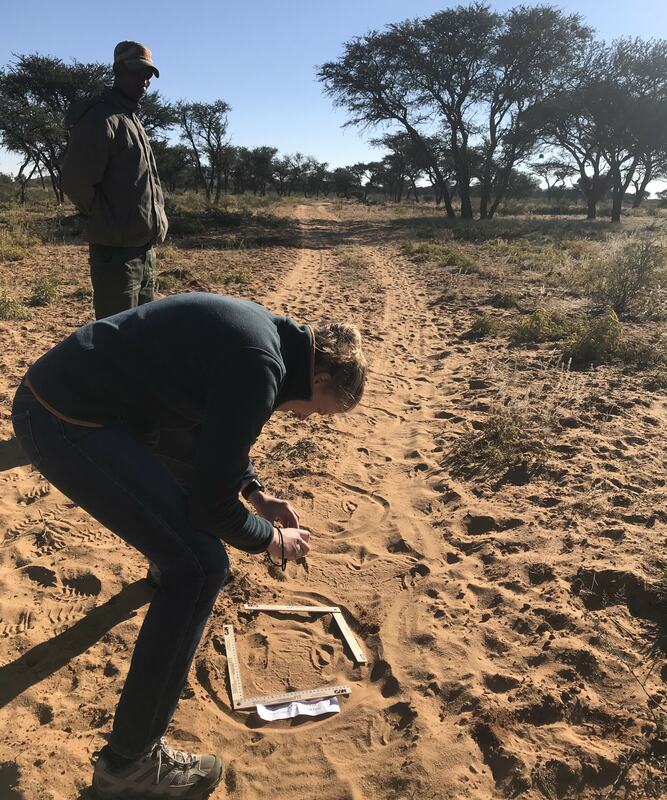 From the challenge of deciphering rhino prints among the other animals and grasses, to the building suspense as we neared our animal of interest, and the satisfaction when we were able to match an individual to a specific foot pattern, tracking became my favorite field work activity. Each day tracking brought a new adventure, adding to the excitement, as we targeted new animals and ventured after each individual or cow-calf pair. The encounters with the rhinos at the end of each track were breathtaking. Never in my life had I dreamed of crouching a mere 50 meters from a wild rhino, admiring its power, beauty, and behavior up close. During those three weeks in the field, I learned more about rhino behavior than any textbook could teach me. I experienced their acute sense of smell and hearing as they attempted to locate our group of researchers approaching, noted the caring way mothers guarded their calves, guiding them protectively through the bush, and observed the creation and resolution of various social groups. 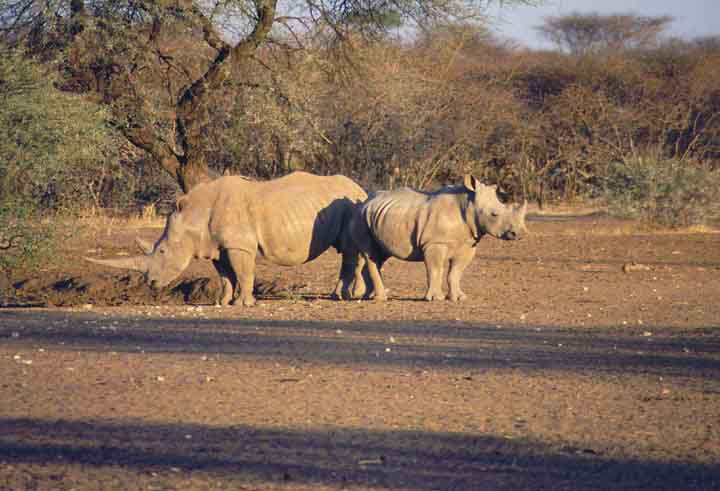 One reserve housed both white and black rhinos, allowing us to compare the behavioral differences between the species, such as their preferred habitat and waterholes, their reaction to vehicles and humans, and their interaction within their species. While many of these observations were visual, many were inferred from the prints. 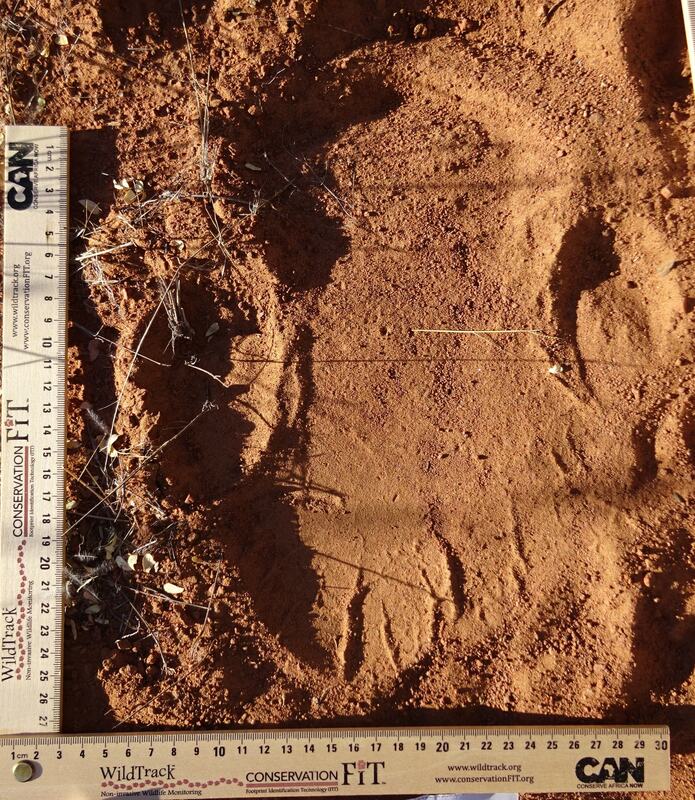 For instance, by noting which individual prints were grouped together, we could conclude which animals belonged in which social groups and by tracking what areas of the reserve we repeatedly found the same foot pattern, we could estimate an animal’s home range. Not only did the data derived from all our observations help us to track the rhino, it created a broad overview of the rhino’s life on the reserves. I would be lying if I didn’t admit that simply being in Africa was almost as thrilling as our daily tracking. Not only did I have the chance to witness stunningly beautiful sunsets and to zip across the reserves on the back of a Land Cruiser enjoying the scenery, I got to observe animals that I had never seen in the wild, such as aardvark, aardwolf, bat eared foxes, genets, and African wild cats. Furthermore, interacting with the staff of the reserves was invaluable to learning about the management of wildlife reserves as well as conservation within Namibia in general. While I had taken a few basic conservation classes during my undergraduate career, they paled in comparison to the insight gained from speaking with those involved daily in the protection and conservation, and with the other researchers who have participated in conservation efforts for multiple years. The Wildtrack program is a symbiotic blending of observing animals’ beauty and behavior in their natural environment with the application of the scientific methods of field research in an effort to not only better understand the rhinos (or another species) in a natural setting but to also help ensure their longevity and safety in their wild habitat.